The agora has historically been an important physical, cultural, political and symbolic space. In ancient Greece it was a place of community assembly, a place where military, political and commercial activities would take place, alongside other events, whether recreational, religious, or otherwise. The agora is also necessarily an outdoor space, but on his new album of that title Christian Fennesz seems to suggest that this particular soundscape is neither inside nor outside (and it is perhaps interesting to note that the album was recorded on headphones in a bedroom at a time when Fennesz had lost access to what he called "proper studio workspace"). Rather, it occupies an imaginary area that refuses any spatial constraints, while acknowledging and insisting upon an acknowledgment of our own relationship to variations of temporality. Fennesz' Agora is neither urban nor pastoral/bucolic. It is of a world, but not necessarily this one, and as such it suggests a challenge to the boundaries of what we might normally think of as the "public sphere". Furthermore then, the agora conjured by Fennesz in this context is by no means necessarily a communal space, and may indeed depict an entirely fractured and atomized social structure. In all of these respects, this work posits a reconsideration of what it means to interact with the world at this state of human history, far removed from ancient and established social and political structures, and yet at a time when we are all more deeply interconnected in many obvious and also insidious ways than we have ever been. It is also, perhaps more importantly for the purposes of the task before us, a really good album. The mind games, if such they are, begin with the mischievously and counter-intuitively titled opening track, "In My Room". We start, then, with an immediate retreat from the public forum, counter to what the album's title might lead you to expect. The track opens with a rough pulse which gives way to an extended mid-range drone, as if we are travelling down a pipeline beneath the market square, away from any society, toward an unknown but almost surely metaphysical destination. Other drones join the originating one, and then chords are very discreetly introduced as the song enacts very subtle changes at its own moderate pace. The internalized soundscape of "In My Room" gives way in turn to a more outward-facing perspective with the second track, "Rainfall". Also almost 12 minutes in length, it is equally meditative, but takes a different reflective path from "In My Room". Opening with a faint and delicate note, almost as of a subway train approaching from a long stretch of tunnel, the song resolves into something approaching conventionality with a very discreet rhythm track and chords that seem to blend something of the outro of Roxy Music's "More Than This" with the burning and crackling of Sonic Youth's "Providence" from the epic and elemental Daydream Nation. There is, by definition, something deeply elemental about "Rainfall" too, as evidenced by the more organic instrumentation at work. We even get something the resembles a gently strummed acoustic guitar chord here and there, albeit that it tends toward distortion, inevitably, and any sense of the bucolic gives way to something more post-industrial. 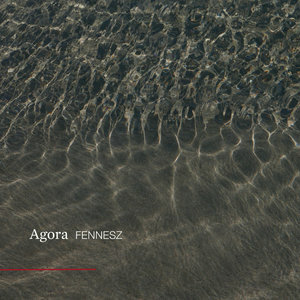 The richer and more insistently sustained (and varied) chords of "Agora" seem to represent the apotheosis of the Fennesz vision for this particular sound space. It also feels, perhaps paradoxically, like the darkest of the four tracks on display here, all while it seems, on occasion, to be reaching toward the light, as morose chords open up into breezier ones, and we oscillate along with them, between poles of more and less hope, or more and less despair, depending on the fullness or emptiness of your particular spiritual glass. On balance, the impetus of this title track seems ultimately then to tend more toward light than the darkness that appeared to be its signature, which may offer a clue as to the temperamental inclination of the album as a whole, although it is difficult to make any concrete conclusions as to the album's disposition in such an abstract setting, particularly when it also seems to offer itself up as something rather like a mirror, if not a palimpsest, for us to see ourselves in, or inscribe ourselves upon. As we appear to have been led toward the light on "Agora", the full flowering of that trajectory appears to come to pass on the final track, "We Trigger the Sun", which seems to be the closest we get to a version of the pastoral here. This song offers perhaps the richest and most expansive sound palette of the four presented to us. There is even a gesture toward melody in these closing moments even while a meditational drone continues to be the backdrop. And those might even be some kind of strings in there somewhere. "We Trigger the Sun" feels positively romantic in places, which we might not be able to say about what has preceded it, for better or for worse. But aside from all this abstract thinking, it should be said that Agora is beautifully measured and evenly balanced, and as a result it is a very satisfying listening experience that appears to be almost hermetically sealed, as befitting an album that was made, as Fennesz himself said, "on headphones". Part of that hermeticism, while also running counter to the idea of a practising and functioning community, also seems to resist any intertextuality or comparison with other artists, but it seems inevitable and necessary that one consider this piece of work alongside another recent release with a similar structure, that being the quite remarkable experience of After its own death/Walking in a spiral towards the house by one of Liz Harris' many creative personae, Nivhek. While the constitution of each album is entirely distinct, and distinctive, it is nevertheless difficult not to think of these two pieces, perhaps even instructively, as somehow analogous to each other, even if contrapuntally. One of the many quite beautiful things about this album is that, to put it in rather unsophisticated terms, it "makes you think" (for example of a comparison to Nivhek) while also allowing you not to, thereby establishing a delightful kind of utopian polity.